* * * ANNO 1913 - DELCASSE (Francia) - LUI VOLEVA UNA GUERRA! * * * ANNO 1914 - ITALIA, IL DILEMMA: "GUERRA SI', MA CONTRO CHI?" L'INIZIO DELLA GRANDE GUERRA - MORTE DI PIO X - ELEZIONE DI BENEDETTO XV - LA TURCHIA CHIUDE I DARDANELLI E PROCLAMA LA GUERRA SANTA - L'ITALIA DI FRONTE ALLA GUERRA EUROPEA - L'ATTEGGIAMENTO DEI PARTITI POLITICI - ADESCAMENTI ED OFFERTE DEGLI STATI BELLIGERANTI ALL' ITALIA - I NEUTRALISTI - IL CONVEGNO SOCIALISTA DI BOLOGNA E BENITO MUSSOLINI - FONDAZIONE DEL "POPOLO D' ITALIA" - LA SITUAZIONE IN ALBANIA - OCCUPAZIONE ITALIANA DI VALONA E DI SASENO - DIMISSIONI DEL MINISTERO - II NUOVO GABINETTO SALANDRA - IL PRINCIPE DI BULOW A ROMA; SUO INCONTRO CON GIOLITTI - TRATTATIVE TRA L' ITALIA E L'AUSTRIA. PROGRESSI DELL' INTERVENTISMO - ASSEMBLEE ED ORDINI DEL GIORNO - IL CONGRESSO NAZIONALE DEI FASCI INTERVENTISTI - IL DISCORSO DI MUSSOLINI - LA CONFEDERAZIONE GENERALE DEL LAVORO E I SOCIALISTI UFFICIALI - L'ATTEGGIAMENTO DEI CATTOLICI - IL TERREMOTO DELLA MARSICA - DIMOSTRAZIONI E CONFLITTI - DIVIETO GOVERNATIVO DEI COMIZI - PROTESTA DEL "POPOLO D'ITALIA" - LE IMPRESE DELLA LEGIONE GARIBALDINA NELLE ARGONNE. * * * ANNO 1916 - ALTRI FRONTI - EROI E MARTIRI - BATTISTI, FILZI ecc. OPERAZIONI SVOLTE SUGLI ALTRI FRONTI NEL GIUGNO E NEL LUGLIO DEL 1916 - LA GUERRA AEREA. EROI E MARTIRI: I GENERALI DI MARIA, GIORDANA, BERARDI E IL COLONNELLO BRIGADIERE CURTI; FRANCESCO RISMONDO, FABIO FILZI, DAMIANO CHIESA, CESARE BATTISTI E NAZARIO SAURO. BENITO MUSSOLINI AL PRIMO ANNIVERSARIO DELLA MORTE, RICORDA CESARE BATTISTI. * * * ANNO 1916 - ULTIMI GIORNI DEL 1916 - VAGHE TRATTATIVE DI PACE. * * * ANNO 1917 - PROPOSTA WILSON - GLI ALLEATI RISPONDONO " NO " !! LA RIVOLUZIONE RUSSA - LE OFFERTE DI PACE SEPARATA DELL'AUSTRIA. - IL CONVEGNO DI SAN GIOVANNI DI MORIANA - INCONTRI SENZA L'ITALIA. DECISO RIFIUTO DELL'ITALIA - CADORNA FA I PREPARATIVI PER LA NUOVA OFFENSIVA SULL'ISONZO. I PREPARATIVI ITALIANI SUL FRONTE GIULIA - L' INIZIO DELL'OFFENSIVA - ALLA TESTA DI PONTE DI BODREZ - LA CONQUISTA DEL MONTE KUK E DEL VODICE - L'AZIONE DIVERSIVA DEL NEMICO SUL RENTINO - GLI ATTACCHI AUSTRIACI AL PASUBIO E AL COLBRICON - L'AZIONE OFFENSIVA DELLA III ARMATA SUL CARSO: LA CONQUISTA DI BOSCOMALO; LO SFONDAMENTO DELLA LINEA DI FLONDAR; CONTRATTACCHI E DIVERSIONI DEL NEMICO. - CEDE IL MORALE - CADORNA SI DIFENDE - GLI ASSI DELL'AVIAZIONE. * * * ANNO 1917 - INFUOCATO CLIMA POLITICO - APATIA DEL PAESE. DAL TAGLIAMENTO AL PIAVE - I CONVEGNI DI RAPALLO E DI PESCHIERA. - IL GENERALE DIAZ SOSTITUISCE IL GENERALE CADORNA AL COMANDO SUPREMO. - LA BATTAGLIA DI VIDOR. *** DOVE FINIRONO I 300.000 ITALIANI FATTI PRIGIONIERI DAGLI AUSTRIACI? QUELLI CHE CADORNA CHIAMO' "vili". * * * ANNO 1917 - IL DOPO CAPORETTO SIA MILITARE CHE POLITICO. IL DOPO CAPORETTO, MILITARE E POLITICO - I PRIGIONIERI - I PROFUGHI - IL PAESE PER LA RESISTENZA - LA RIAPERTURA DELLA CAMERA - IL DISCORSO DI ORLANDO E LE DICHIARAZIONI DEGLI EX-PRESIDENTI DEL CONSIGLIO - L'ORDINE DEL GIORNO DEL SENATO. IL NUOVO SCENARIO - LO SCHIERAMENTO DEGLI OPPOSTI ESERCITI - L'OFFENSIVA NEMICA DEL NOVEMBRE-DICEMBRE DALL'ALTOPIANO DI ASIAGO AL MARE - L'EROICA RESISTENZA DELLE TRUPPE ITALIANE - VICENDE DELLA LOTTA - ENTRATA IN LINEA DEGLI INGLESI E DEI FRANCESI - RICONOSCIMENTI DEL NEMICO - L'OPERA DELL'AVIAZIONE E DELLA MARINA. LA DEFEZIONE RUSSA DOPO LA RIVOLUZIONE - LA CONFERENZA INTERALLEATA DI PARIGI - LA DICHIARAZIONE DI GUERRA DEGLI STATI UNITI ALL'AUSTRIA e MUSSOLINI PLAUDE ALL'INTERVENTO - LE SEDUTE PARLAMENTARI ITALIANE - "RESISTERE, RESISTERE, RESISTERE"
RIORGANIZZAZIONE DELL'ESERCITO - COMBATTIMENTI NELL'ASOLONE E NEL SOLAROLO. - LA BATTAGLIA DEI TRE MONTI - L'INVIO DI TRUPPE ITALIANE IN FRANCIA - LA CONQUISTA DEL MONTE CORNO - L'ATTIVITÀ DEGLI ARDITI - IL PROCLAMA DEL RE ALL' ESERCITO E ALL'ARMATA VITTORIOSA OFFENSIVA AL PASSO TONALE - PREPARATIVI NEMICI PER UNA GRANDE OFFENSIVA, CON GLI ERRORI. L'ESERCITO AUSTRIACO IN CAMPO - PRIMO GIORNO, PRIMA COCENTE SCONFITTA - LA DISPERAZIONE DI BOROEVIC - LA "GENIALITA' ISTINTIVA" DEGLI ITALIANI - LE GIUSTIFICAZIONI DEI GENERALI AUSTRIACI SULLA LORO DISFATTA. * * * ANNO 1918 - DAL MONTELLO AL PIAVE . - " RIPASSANO IL PIAVE ! " LO SVOLGIMENTO DELLA BATTAGLIA DAL 16 AL 18, dal MONTELLO AL PIAVE - IL LOGORAMENTO DEL NEMICO - LA CONTROFFENSIVA ITALIANA - LA VITTORIA - "RIPASSANO IL PIAVE !! " - I PROCLAMI DI VITTORIO EMANUELE III, DI DIAZ, DEL DUCA D'AOSTA. L'OPERA DELL'AVIAZIONE ITALIANA NEL PRIMO SEMESTRE DEL 1918 - BOMBARDAMENTI DI CITTÀ ITALIANE INDIFESE - LA MARINA ITALIANA NEI PRIMI SEI MESI DEL 1918 - ATTIVITÀ DEGLI IDROVOLANTI - LA BEFFA DI BUCCARI, IL TENTATO FORZAMENTO DEL PORTO DI POLA; L'AZIONE DI PREMUDA; LO SBARCO AUSTRIACO PRESSO ANCONA - L'ATTIVITÀ AEREA NELLA GRANDE OFFENSIVA - UN EROE DI 23 ANNI - LA MORTE DI FRANCESCO BARACCA. L'OPERA DEL XVI CORPO D' ARMATA ITALIANO IN ALBANIA NEL 1918 - LE AVANZATE TRA IL DEVOLI E L'OSSUM E DALLA VOJUSSA AL SEMENI; LA CONQUISTA DELLA MALAKASTRA; LA PRESA DI FIERI E DI BERAT - LO SCHIERAMENTO DELLE FORZE ALLEATE E NEMICHE IN MACEDONIA - LA GRANDE OFFENSIVA DEL SETTEMBRE-OTTOBRE 1918 - GLI ITALIANI INSEGUONO I BULGARI - L'ARMISTIZIO - L'AVANZATA IN ALBANIA: OCCUPAZIONE DI DURAZZO, TIRANA, SCUTARI ECC.- L'OPERA DEL II CORPO D'ARMATA ITALIANO IN FRANCIA - GLI ITALIANI IN MURMANIA E IN MANCIURIA - LA BRUTTA FINE DEI ROMANOV. LA DECISIONE DI FARE DUE OFFENSIVE SEPARATE - IL PIANO D'ATTACCO DI LUDENDORFF - I SUCCESSI DI MARZO, APRILE, MAGGIO - LA FRANCIA SI RIPRENDE CON FOCH - L'AUSTRIA FALLISCE IN ITALIA, RIPERCUSSIONI - LA GERMANIA SOLA - L'AUSTRIA DISFATTA - LA FINE DELLA QUADRUPLICE. LE OPERAZIONI DAL LUGLIO IN POI - IL PENSIERO DEL COMANDO SUPREMO SUL COLPO DECISIVO DA DARE AL NEMICO. - IL PIANO STRATEGICO . - LO SCHIERAMENTO DELL'ESERCITO ITALIANO E QUELLO DEL NEMICO. - ARRIVANO GLI AMERICANI IL 10 AGOSTO, PER LA "CAUSA DELLA CIVILTA'"(DIAZ). L'ATTACCO SUL GRAPPA - LA BATTAGLIA DELLA SERNAGLIA - VITTORIO VENETO - LA LOTTA NEGLI ALTRI SETTORI - LA DISFATTA NEMICA - L'AFFONDAMENTO DELLA "VIRIBUS UNITIS ". 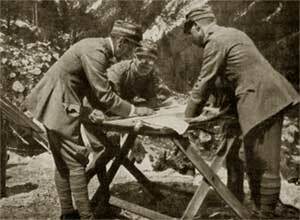 L'ULTIMO BOLLETTINO DI GUERRA - IL 1° NOVEMBRE L'ESERCITO ITALIANO CONTINUA L'INSEGUIMENTO NELLA VAL D'ADIGE - TRENTO, BOLZANO E IL BRENNERO OCCUPATE. - TRIESTE LIBERA. LE CLAUSOLE MILITARI - LE CLAUSOLE NAVALI - CONDIZIONI AGGIUNTIVE SULLE CLAUSOLE MILITARI. LE 34 PESANTI CLAUSOLE - IN GERMANIA SI TEME UNA RIVOLUZIONE SIMILE ALLA RUSSA - LA FUGA DI GUGLIELMO - FRANCIA, INGHILTERRA, USA, ITALIA, TUTTI HANNO VINTO LA GUERRA. OCCUPAZIONE OLTRE LA LINEA D'ARMISTIZIO SCRITTE DA WILSON - IL RITIRO DEI VINTI - ITALIANI OLTRE IL BRENNERO - LA SINTESI DI UN EPILOGO - ORLANDO INVOCA SACRIFICI ! SACRIFICI ! - RIMANEGGIAMENTI DEL MINISTERO - I DELUSI DELLA VITTORIA - MUSSOLINI: CHE FARE? FONDO I FASCI! GLI UFFICIALI - LA TRUPPA - GLI ALLEATI - I SACRIFICI DI SANGUE - I MORTI - I FERITI - LE MALATTIE - LE RICOMPENSE - LE SPESE DI GUERRA - I DATI COMPLESSIVI DELLE NAZIONI PARTECIPANTI. WILSON IN FRANCIA E IN ITALIA - LA CONFERENZA DELLA PACE - VIOLENZE JUGOSLAVE CONTRO GLI ITALIANI - L'AZIONE DIPLOMATICA PER RISOLVERE LA QUESTIONE DI FIUME - I MESSAGGI DI WILSON (TRIONFANTE) E DI ORLANDO - LA DELEGAZIONE ITALIANA DELUSA LASCIA PARIGI - LA MINACCIOSA SITUAZIONE INTERNA PER LA "VITTORIA MUTILATA" - INTANTO SI FANNO AFFARI POCO CHIARI. IL (SEGRETO) COLPO GROSSO DELLA FRANCIA - GLI ARDITI DELUSI - - BENITO MUSSOLINI FONDA I FASCI DI COMBATTIMENTO. GLI SCIOPERI PER IL CAROVITA - LA REAZIONE DEGLI ARDITI - LIQUIDAZIONE DELLA GERMANIA - SCAPA FLOWW - LIQUIDAZIONE AUSTRIA, BULGARIA, UNGHERIA - L'ALBANIA E L'ITALIA - LA QUESTIONE FIUME - BATTAGLIA DI RIBELLI E ADDIO ALBANIA - PESANTE CLIMA POLITICO IN ITALIA - MUSSOLINI FALLISCE ALLE SUE PRIME ELEZIONI - POI IL 1° GENNAIO 1920, CON UN ARTICOLO SUL POPOLO D'ITALIA INIZIA LA SUA RISCOSSA - ANNO 1920: INIZIA UN'ALTRA STORIA.